Hey everyone! I have missed checking in daily and getting around to leaving comments. This is the "commissioned" zentangle that is not quite complete. It will be a gift from mom to her 16 year old daughter. I will be adding some color also. The job is going very well (though I'm not sure what my employer would say). Very excited that my brain still works!!! Though I would really enjoy spending more time on my art, can't deny that getting out of the house and meeting some new people has been good. It has been hectic this past week trying to get the decorations out, shopping and the job. Pleased to say the decorating was completed today, now behind in wash, BigBoy arrived home safely this afternoon for the holidays, a whole lot to be thankful for! Also, I sold five pieces of art this past week, all a result of the show in November! AND today I found out the owners of the gallery have saved a spot for me after I emailed some photos of my art! I am to meet with them this Wednesday at the gallery. Uh, my concern is, when, cause I need some more pieces! OK......so I will be working that in during my sit down time!!! Working on getting around to "see" everyone the next couple of days! Ho Ho Ho! This one is STUNNING! I really want you to do one for me. I am willing to pay for a big one! I will send you an e-mail. So what is the new job you started? I missed that somewhere along the way of the blogs. Been so busy and trying to finally sit and catch up with everyone. Superb one!!! The bird in the nest is so cute! Loved each deatil... intricare work there. Good luck with your job and the upcoming show. Pray for you. Congrats on the sales of Art. AND a spot in a Gallery. Looks like your Art it a success. So happy for you. They say if you want to get something done give it to a busy person. Sounds like you use your time wisely. Keep up the good work. Oh and.. Lovely Zen you are doing here. Be sure to show it when you add color. Congrats on selling some of your art. It sounds like you are enjoying life right now. I love the music in your zentangle. I like what Cris said, if you want something done, give it to a busy person. That makes sense! Sounds like you're doing well these days. yay you!! i have always been amazed at how you try to fit everything in, AND have time for prince apollo? give him a sunday smooch from me. I was just thinking about you and wondering how the new job was going. So happy to hear that it is working out well for you. You sound like me, with all you have packed into your weeks. I wonder where to find any spare moments for art. Sometimes I wish I had a separate studio somewhere that no one knows about but me where I could go and disappear for an afternoon and play. 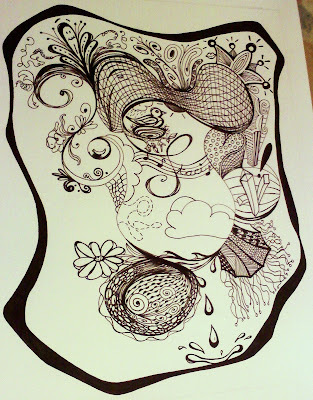 Love this zentangle and I would love to see it in color! Lovely zentangle. Great about the art studio!!! Bravo!!! Great you like your job. How exciting you have sold some of your artworks! This one turned out swell!